Cool, raw and stark we are proud of this stunning mixture of concrete and aluminum which is dazzling many of our clients! 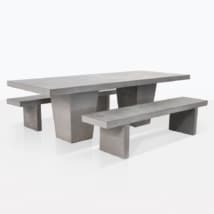 This modern Concrete Table with 8 Alix Chairs dining set comprises of a 98”x 39” Raw Concrete Tapered Outdoor Dining Table included are 8 Alix Aluminum Modern Dining Chairs. Sleek. Slick. Stylish. Get ready for the rock’n’roll of concrete dining sets with our Concrete Table with 8 Alix Chairs. This is a collection that speaks to contemporary living; clean lines, stylish and functional. 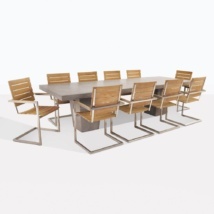 Whether it is for your garden or for a business, such as a café or restaurant, we can assure you that you will make an impact with the Concrete Table with 8 Alix Chairs. 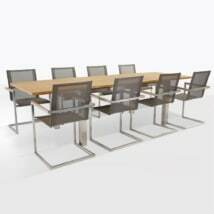 This set also is an phenomenal indoor set – imagine the conference room in your office made infinitely cooler with this state of the art table and chair set. Or maybe you are going for eclectic indoors? Put this sharp set on your beautiful carpet on top of varnished wooden floors… just breathtaking. 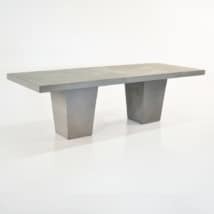 The Raw Concrete Tapered Outdoor Dining Table shown is from our Raw range, it is made from fiberglass and resin reinforced concrete. This unique concrete composite has the look of raw concrete but not the weight, it also gives it a shape and strength that 100% concrete could not assure. 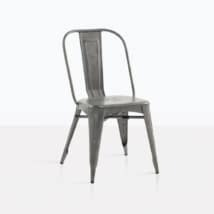 The Alix Aluminum Modern Dining Chairs shown are fabulous, mid century style metal chairs made of Aluminum – perfect for outside as they will not rust. They are light, finished with an amazing matte metal finish. The Alix Aluminum Modern Dining Chairs is often used by our clients in the movie industry for staging. Mix and match with other chairs or styles of concrete tables for variations on this look. We love the wicker and metal chairs with this table! The Concrete Table with 8 Alix Chairs dining set looks amazing in contemporary apartment settings. Envision a brick wall on one side, concrete on the other, a few structured concrete planters bear soft green money plants, and in the midst of all this diffused industrial setting is this glamorous Concrete Table with 8 Alix Chairs dining set laden with olive branches for decoration, cheese plates and a bottle of your favorite red wine. Contemporary meets luxury? We think so! Place the Concrete Table with 8 Alix Chairs in the midst of a garden for an epic contrast that the eye will travel to! This is not just a fabulous outdoor dining set, it is a piece of art that you and your guests will be wowed by. Perhaps you have a new restaurant with a courtyard area? Purchase four of the Concrete Table with 8 Alix Chairs sets and weave them through your space with a smaller concrete table and matching Alix Chairs, or break up the look with some Reclaimed Teak. Really the options are endless, and we are happy to help you find the most exciting and suitable look for each space that needs a bit of sprucing up! At Teak Warehouse we specialize in all things outdoor. As well as superb dining sets, we sell tables and chairs separately, we have bar units, anything you need for poolside, and our incredible deep seating collections. We started over 20 years ago specializing in teak patio furniture and through our excellent products, manageable price points and wonderful reviews from our terrific clientele; we have expanded to raw concrete, #316 Stainless steel, Batyline® and Textaline® mesh, Sunbrella® fabric, and Reclaimed Teak. Call us today to discuss the best options that will work for your space, we want to cater to you! The Concrete Table with 8 Alix Chairs is available now ready for purchase! We deliver in and out of state, providing quotes for only the best white glove delivery services. Our items are quality checked, blanket wrapped, driven to you and then set up in your space. Purchasing furniture shouldn’t be hard work, it should delight you! We aim to make the experience a pleasant one and arrange for everything to arrive in a timely fashion and in excellent condition. 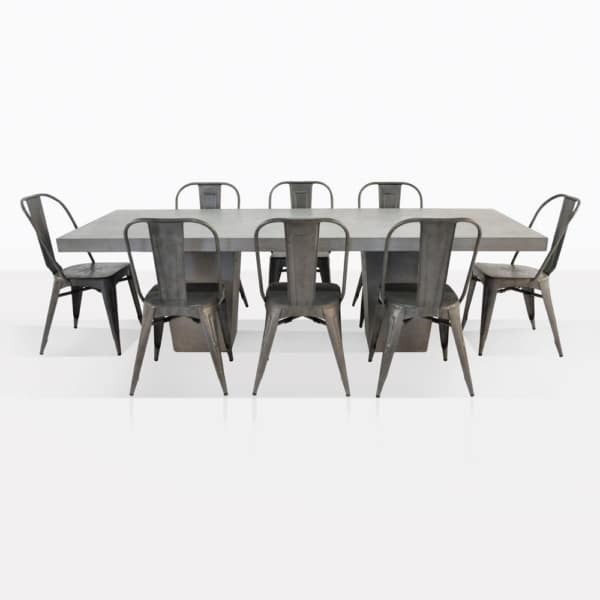 The Concrete Table with 8 Alix Chairs is a wonderful dining set for use inside and out. Bring contemporary living to your home, and enjoy this terrific set.